After spending a day out at the McCoy Family Home (that’s what we call my mom’s house… because though we are grown, a piece of our heart will always remain in the home we built together… the structure is but a house… it is the love that makes it a home), we popped in at my friend’s house for a super quick visit. I noticed she had a small, yet ambitious (because she also has a one year old… and reading anything other than Dr Seuss feels downright scholarly), stack of books in her reading nook (you know who you are and you know you owe me for making you sound super classy for pushing a chair over by the window for you to sit in, drink coffee in, and attempt to read). Among the books, I noticed one about something called Nature Deficit Disorder. Nature Deficit Disorder – The long and short of it is that this guy has a hypothesis (that I pretty much agree with) about people, particularly kids, developing behavioral disorders because they are sitting in front of screens, instead of running around outside. I mean… it makes sense. We have energy that needs to be exasperated. If we sit inside, the excess energy manifests and we exert this energy in inappropriate ways. Think about it. When I am outside, I take my anger out on the mosquitoes around me. I smash them (this comment may get my Lifetime Girl Scout Membership revoked). If I am not able to release this energy on bugs, perhaps I may slap another human (like that idiot texting and driving in the lane next to me… which is very distracting as I try to type this blog post while driving down the highway. Just kidding… don’t do that. Only police are allowed to use laptops and cell phones while they drive). So, what can be done to prevent our children (and ourselves) from becoming slaves to the screen and risk developing NDD? Well… the solution is pretty simple… GO OUTSIDE! Some parents are raising their kids without screens, which is their decision, but in my opinion… and for my family… screens are fine… IN MODERATION. We just need to be sure our kids aren’t getting (woah, double checked my spelling on gypped and learned the word is highly offensive… and after learning the correct spelling, I can see why) screwed (that’s more appropriate) out of the many experiences that are available once they cross the threshold of your front (or back) door. Take your kids outside. Go for a walk. Meet some friends at the park. Visit a garden, if you don’t have one of your own. 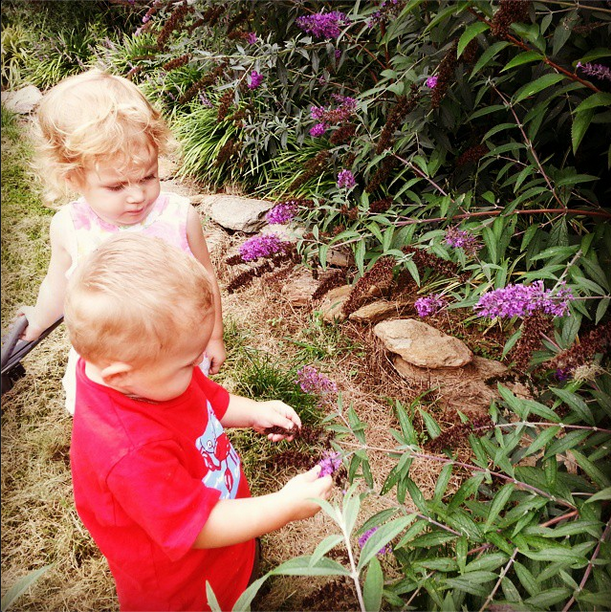 Let your kids get dirty (develop those immune systems). Play with worms. Chase ducks around the pond. Jump in puddles. Roll down a grassy hill. I don’t care if you play in the front yard, or take a camping trip to completely disconnect… both are fabulous ways to connect with nature. Just let your kids BE. Let them experience. Let them learn by DOING. And maybe most importantly… do it together. Set an example by showing kids HOW to interact with the world around them. Now, get up… and get OUT… and take a kid with you! If you don’t know how to function outdoors, find an old person who was alive before screens came into our lives (because it didn’t happen that long ago) and let them show you how REAL people have fun. Hurry, before you turn into a freaking robot!